The name Chez Faye Cafe rhymes so nicely that it sounds like a place mentioned in a poem. The choices on the menu are quite interesting as well since there are food items from all around the world. Just to name a few, there's Italian spaghetti, Thai curry, Japanese rice/noodle dishes, and a number of Korean dishes. Typical cafe fare such as soup and sandwiches is also available. I began wondering how the chef could possibly be proficient in all those different types of cuisine. Feeling quite doubtful, I ordered the Korean chicken bibimbap with miso soup ($8.95). Maybe because I was really hungry, the bibimbap was not bad at all. I expected much worse in a cafe setting, but it was not much different from what I would find in a Korean restaurant. 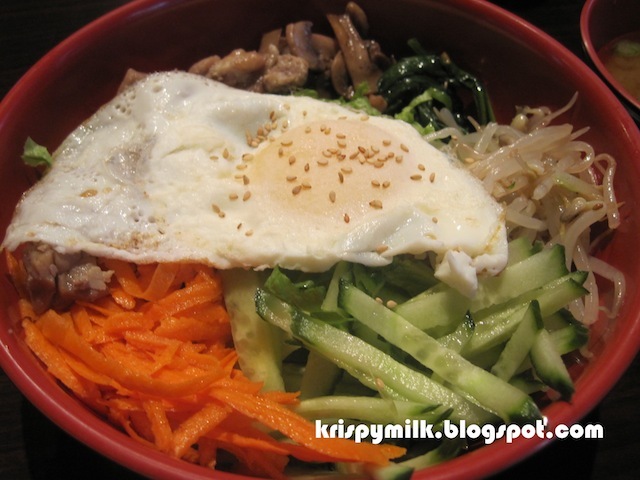 The dish was only slightly warm, but I don't think bibimbap is supposed to be piping hot anyway. 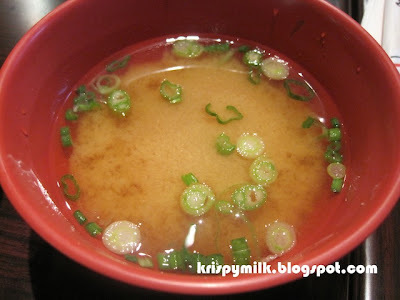 The miso soup was standard, and I just considered it a bonus that came with the meal. It was one of the better meals I've had in a cafe, and I really like the idea of serving more than just the regular cafe food such as salads, pastries and sandwiches.